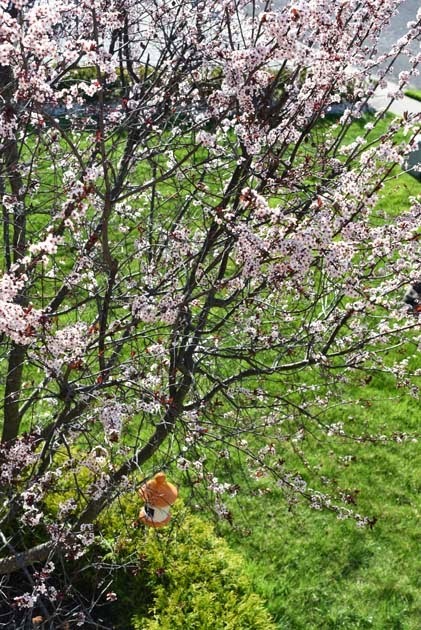 Sometime around April, the weather around here changes radically. The ground shakes off the expanse of white snow and gets to work. Tiny pale green leaves unfurl as if touched by some magic wand. Flowers blossom. Pollen blows around in the wind to keep the cycle of life going. Trees turn a shade of deeper green. The temperature soars.Ceiling fans are switched on. Windows are opened wide. Evenings stretch longer.The neighborhood kids come calling sharp at 4:30 every afternoon. The girls ride their bikes, play hide and seek, run around playing tags from one backyard to another. Everything around says "Summer is just around the corner". Which means I have to start eating healthy. I don't know why this happens. It is not that I have lofty aims to sunbathe in a bikini by the pool or anything. But with any sign of summer, I start digging in my pantry for that forgotten packet of Quinoa and dusting the Nutribullet to make the first health dripping juice of the season. Quinoa or Keen-wah is a grain I had no clue of until 2010. I am a rice eating Bong and I don't like any grains other than rice. Not even wheat. Period. So if I have to eat a grain which is not rice, I better get the most advantage out of it. And it better not require more than 30 minutes of my time. Yeah, I am very particular that way. The first time I tried Quinoa at home was in a salad. It was good if not great and I noticed that the high protein in this grain does quell my hunger for a longer period and read that it has lots of vitamins and nutrients. Now honestly if my Mother were to read this, she would have pooh poohed the whole idea and say that there are plenty of other food with the same benefit and it is a balanced meal that is important and not something which is touted as "superfood". Agreed. No need to buy and eat Qunoa if it is super expensive where you live. 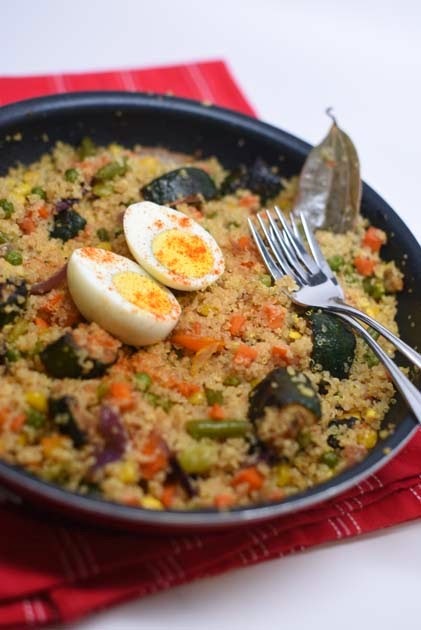 For me what works, is that a dish like Quinoa Pulao makes a nice one pot meal to take to lunch. If you don't get this grain, don't fret, you can do the same with a Daliya Pulao. Cook Quinoa according to package directions. If there are no direction then cook as follows. Soak 1 cup of Quinoa in water for 2-3 minutes . On the stove set to boil a pan with 3 cups of salted water. When the water comes to a boil, drain the quinoa on a strainer and add to the pan. Lower heat to medium and cook for 12-15 minutes. Little thread like thingy will come out from the seeds when they are cooked and the tiny seeds will turn translucent. Once done, drain the Quinoa, put it back in the pan and let it sit for 5 minutes. I also rinsed it in cold water while draining and then fluffed it with a fork. Add the cooked frozen veggies. Sprinkle a little Bhaja Moshla(dry roasted cumin, coriander and dry red chilli powder) and saute for a few minutes. You can use any other masala of your choice too, a little Garam Masala or Biryani Masala works great. Depending on how healthy you want to eat, you can fry the vegetables more or less. Add the cooked Quinoa gradually, tossing it with the veggies. Saute for a about 3-4 minutes. Adjust for salt and some chilli. 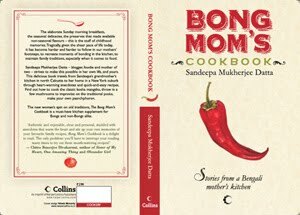 When I asked for suggestions on the letter "G" in the series A-Z of Bengali Cuisine, a lot of ideas came pouring in. From Ghugni, Ghonto to Golaap Jam, Gokul Pithe the names were endless. I went into deep thought over all the suggestions and in the process found two amazing recipes for Goalondo Murgi and Ghugni. I steeled my heart and skipped "Golda Chingrir Malaikari" as we already had "Chingri Malaikari" while in C.
Finally after much dilemma(as if), the dishes that I felt could truly represent the Bengali Cuisine are here. If I am totally honest, I must admit that I skipped stuff like GolaapJaam because I had no idea how to make it. 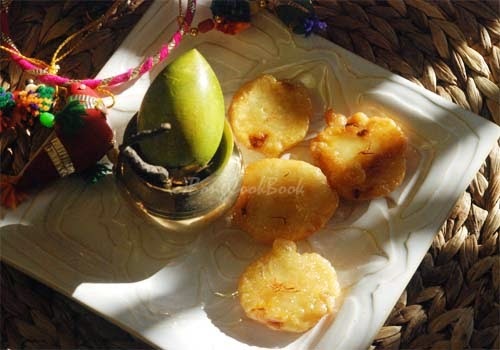 Gokul Pithey -- Pithey is a very Bengali sweet made during the harvest festival of Poush Parbon, celebrated during Makar Sankranti in the cold months of January. Pithey was a typical home-made sweet made with basic agrarian ingredients of the region like rice, date palm etc. Many kinds of pithey were made and Gokul Pithey is a particular kind of pithey where a flat disc made of coconut and khoya is dipped in a batter of wheat flour, deep fried in hot oil and then soaked in a syrup of sugar or jaggery. Gota Seddho -- "Ma said, "The day after Saraswati Pujo is Sheetol Shoshti. Shoshthi is the goddess of fertility and worshiped by Mothers as a guardian angel of their offspring. Sheetol==Cool. And on the day of sheetol shoshthi, cold gota sheddho that had been cooked the previous day, is to be had by Mothers worshipping Ma Shoshthi. The way your Dida made Gota Sheddho was by boiling kali urad(the urad dal with skin) known as maashkolai in Bengali with five different vegetables in season which were to be added whole, little salt, sugar to taste, some pieces of ginger and drizzle of raw mustard oil to finish off. The vegetables most commonly used were small red potatoes, small eggplant, sheem, whole green peas in their pod and baby spinach." Ghonto -- Ghonto is a typical Bengali dish which means a mishmash of different things, primarily vegetables. I guess it comes from the word "ghanta" which means to mix. 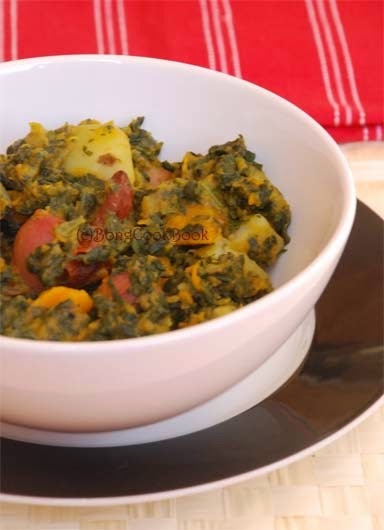 Typically therefore a Ghonto will have vegetables which are softer and so will easily become a mishmash. 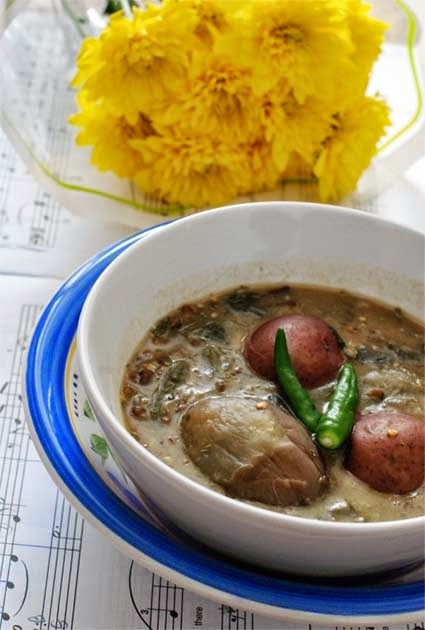 Vegetables like pumkin, eggplant and greens are therefore almost always a must in a Ghonto. Of course a Bengali will have a fish version of everything and to abide to that theory, there is Muri Ghonto made with fish head and potatoes. Ghugni -- Ghugni or Ghoognee is a very very popular snack in Bengal and in parts of Bihar and Orissa. 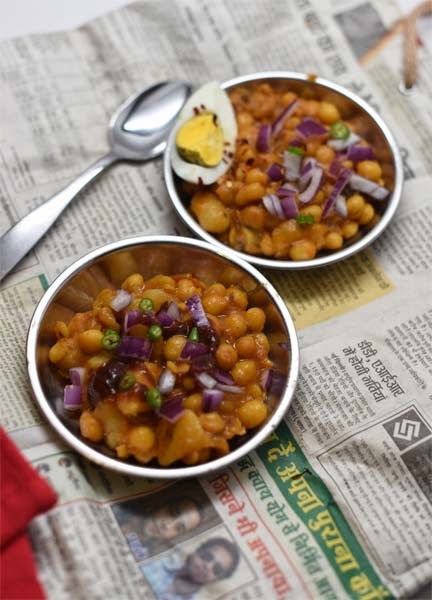 It is made with dried white peas and cooked with myriad spices including Bhaja Masla.While the Northern India has its Chhole, Bengal has its Ghugni. 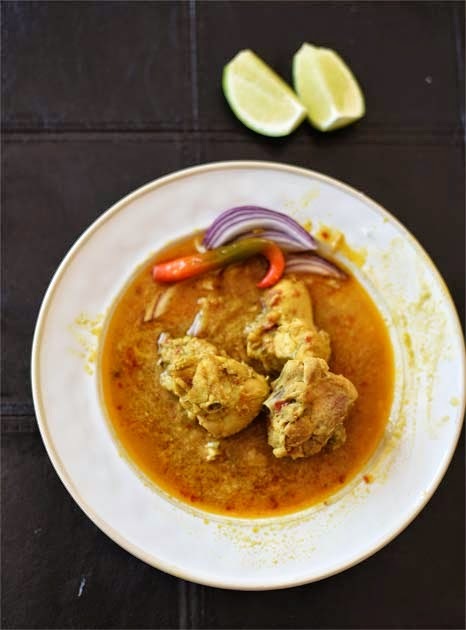 Goalondo Steamer Fowl Curry or Goalondo Murgi -- A rustic curry cooked by the Sylheti boatmen on the steamer that plied the river Padma, from Goalondo Ghat to the interiors of towns in Bangladesh.